"It was 7.30 in the evening and the 3 of us arrived at the little car park close to East Gate; my brother Andrew was staying at my house as was my son Matthew... they wanted to see the 1980 UFO landing site that whistle-blower Larry Warren had talked about the previous week, when Larry had taken a group of us around the forest pointing out areas of interest, and my plan was to retrace Larry's steps. 7.35pm, a friend of mine Jonathan arrived; we stood chatting in the car park for 10 minutes then walked up the road towards the entrance to what was Track 12; we couldn't help but notice the noise the owls were making... it sounded like every owl in Suffolk had descended on the forest; we could hardly hear ourselves talk; after a 10 minute walk we arrived at the entrance to the track. We lent on the gate staring at the full moon lighting up the track and chatted for another 20 minutes, then Jonathan bid us good night and went back to his car and we started to walk up the track. Andrew and Matthew had never been to Rendlesham before and were not really into UFOs, unlike me who had few strange sightings, one of which was 27/12/1980; this event involved a large ball of fire falling from sky which changed direction like it was controlled: I was in Essex when I saw that, along with many other witnesses; yet it was not until years later that I realized my sighting was probably related to the famous Rendlesham UFO incident that happened here in late December 1980. It was a lovely evening, a clear night with a big full moon; weather was quiet warm and apart from the owls we were there alone... or so we thought: We headed up first half of the track which is more of an unmade road. I can't remember just the 3 of us ever doing anything together, so this was really nice, even if it was just a walk through forest... hardly the most exciting thing for us to do, but how wrong I was! After about a 25 minute walk we arrived at the crossroads as it's known; to the right was a logging road; to the left and straight on are pathway tracks: It was at this point I became disorientated; can't explain why. I led the way and we took the lefthand pathway; I said that I would show them Col. Halt's UFO landing site; this pathway was very dark; the moonlight was shielded by the trees; we only had a couple very small keyring torches with us: We wandered around the pathway looking for the clearing known as 'Col Halt's site'; after a good 10 mins I realized we were nowhere near this site, so we walked back to the crossroads with me feeling a bit silly: We stopped at the crossroads and Andrew said he could sense 'evil' in this particular spot. Andrew is very sensitive to paranormal stuff, so we headed up pathway towards Caple Green, (Larry's 'landing site'); a bit further up the pathway we came to a small crossroads with small paths leading off to the left and right; then things started to happen that will haunt us for the rest of our lives. We stood frozen staring at the entities on either side of us... then Andrew said 'Del, I cant breath': I turned to help Andrew just as Matthew said 'Dad look': I turned and my heart skipped a beat, as standing in front of us was a giant, well over 10 ft tall... which could in fact, have been up to 15ft tall! We just stood there not knowing what to do; I thought if the 3 of us rushed that giant it would bounce us like rag dolls. For a few seconds we just stood there staring at this huge figure; it had very long hands and long fingers; it was absolutely frightening; it's face looked like an owl or an Anglo Saxon mask, (it might have been a mask or helmet I don't know): anyway, me and Matthew were fixated on the giant; then poor Andrew said 'Del can't breath'; I said 'shall we back up?' With that there was loud crack, like a branch being whacked against a tree or something; we backed up about 20ft still surrounded by these entities; the temperature rose a bit and Andrew could breath again. We should have legged it in the first place but me and Andrew were not up to running anywhere; we just stood there trying to make sense of what we were seeing. These figures were like holograms, except the giant that looked more solid. Through the trees we kept seeing red lights appearing for split second, then Matthew shouted 'Dad, the giant - it's getting closer', so we began retreating then turned and walked up a pathway staring at these strange entities that were accompanying us. Oddly, we all had this strange feeling of being protected; as we walked I was staring at the monks... they were only about 4, maybe 4 and a half foot tall; you couldn’t see their faces, but they all moved together like one; in my mind we were safe because these monks were there. Were we going to make it home? our thoughts were endless. The closer we got to gate the more we speeded up and the entities seemed to glide along beside us. We reached the gate then stepped onto the road and the entities vanished. We hurried up the road back to the car park; we were all so relieved when we got to the car; every part of my body was aching; I unlocked the car and we opened the doors and stood there having a cigarette; the interior lights giving us a bit of comfort; we were gradually getting our breath back and all trying to speak about what had just happened. The relief of getting back to the car... then, just when we thought it was all over and we were safe; I heard 'Dad, behind you, look': I turned round and couldn't believe it... right there on the edge of the car park stood 5 little silver/blue guys, which couldn't have been any more than 2ft tall. Suddenly the ground started to shake like a train was passing beneath where were standing; at this point we jumped into my car and we spun out of the car park... which must have been at a speed of close to 100mph... those BMW's can certainly move when needed! As we skidded to halt at the junction, my brother said 'Del, soon as you can pull over'; so, I pulled over thinking he wanted to be sick; 'not here you idiot - get us outta' the forest first' he shouted; we drove out of the forest, an on through the next village, then stopped in lay by with the engine running. Andrew spoke; 'Del, something got me': Andrew undid his jacket, rolled up his shirt and there was cut on each shoulder, bleeding, but there was no holes in his shirt or jacket. 'Lets get home': I floored the accelerator and we really motored back to Felixstowe which normally takes about 40 minutes in a car; we got back to my place and literally ran indoors. Matthew grabbed his laptop, 'I'm gonna look up demons and giants Dad'. He opened his laptop and before he pushed any buttons the words appeared on his screen, like something was trying to communicate; Matthew just slammed the laptop shut; I glanced at clock and it was 9.55pm. that cant be right I thought, so I checked my other clocks and our phones...yep 9.55. We had a coffee and I had a look Andrew's injuries.. then took some pictures with my camera phone. We sat down and talked about the events of that night; somehow we must have gained time; no way could we have done all that and be back indoors by 9.55. We talked until about 2 in the morning, then Andrew stood up and said 'I'm going home Del'; 'What do you mean your going home' I said, 'you live in Devon, that's 7 hours drive'... he said 'I don’t know what’s' happened to us tonight, but I’ve got a wife and kids at home'. So, he left and drove home; me and Andrew didn’t speak about that night for over a year, in fact we didn't speak at all in that time: to this day I can't understand how or why Andrew got hurt, yet me and Matthew didn't. 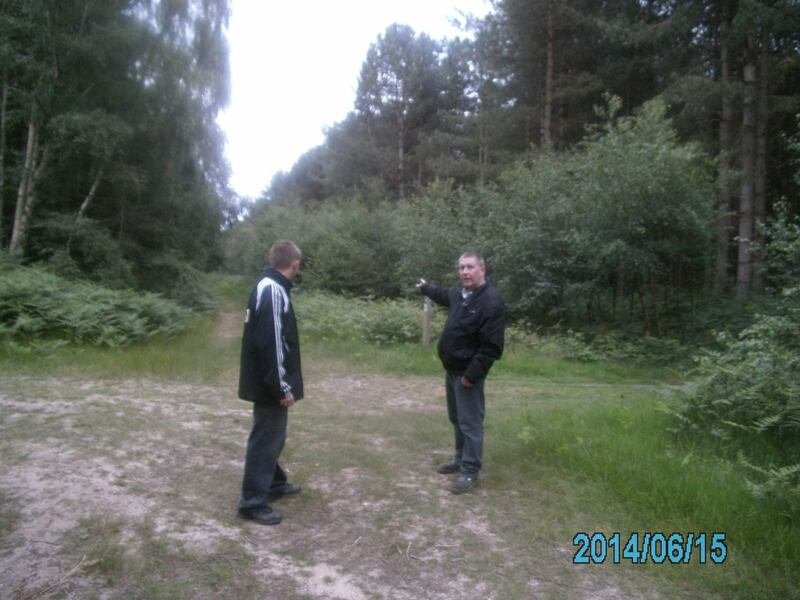 In September 2014 Andrew came with me and group of people to Rendlesham during daylight hours; since then he has been back few times and joined up with our group here at Rendlesham; all three of us have talked things over with the researcher Brenda Butler. We now go to the forest every chance we get. This is my statement of events."